Not to be outdone by other News agencies, Reuters have released their 'top pictures' for 2008 (Warning: some pictures are very graphic). 1. Swimmers compete in the Water Performance section of the of the 2008 Cold Water Winter Swimming Championships in London, February 10, 2008. 2. A young man with an arrow in his head arrives at hospital following ethnic clashes in the town of Nakuru in the Rift Valley area, Kenya,?January 26, 2008. 3. Pope Benedict XVI prays at Ground Zero in New York, April 20, 2008. 4. Shadows of Bosnian Muslims are cast on the names on a monument inside the Potocari memorial cemetery early July 11, 2008, before a funeral ceremony to commemorate the 1995 Srebrenica massacre. 5. An international express train crashed into a collapsed bridge in the Czech Republic on Friday, killing at least six people and injuring dozens. 6. Refugees walk past the body of a Congolese government soldier lying on the road at the front line near Kibati, north of Goma in eastern Congo November 12, 2008. 7. Lucy Moore walks across a record-breaking photo mosaic of her grandfather in Birmingham, central England, August 23, 2008. The Big Picture mosaic is 900m square in size and creates an image made of thousands of photographs submitted by the public. 8. A would-be immigrant prays after arriving at the Puerto Rico beach on Spain's Canary island of Gran Canaria July 1, 2008. 9. A rabbit is seen in front of U.S. Marines, from the 24th Marine Expeditionary Unit, near the town of Garmser in Helmand Province, May 19, 2008. 10. An Iraqi soldier grieves over the body of his father, who was killed in a bomb attack, outside a hospital morgue in Baquba, June 22, 2008. 11. First World War veterans Henry Allingham, Harry Patch and Bill Stone?at the 90th anniversary of Armistice Day in London November 11, 2008. 12. 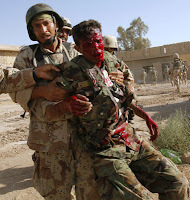 A Iraqi soldier helps a wounded soldier at the site where an explosive device went of inside a house during security operations in Diyala province August 8, 2008. 13. Primary and middle school students participate in a winter military camp for civilians at the Cheongryong Self-denial Training Camp run by retired marines in Ansan, about 40 km 25 miles southwest of Seoul, January 7, 2008. 14. A Congolese Government soldier walks on the road towards Sake holding his daughter's hand, near the city of Goma in eastern Congo, November 4, 2008. 15. Sgt. William Olas Bee, a U.S. Marine, has a close call after Taliban fighters opened fire near Garmser in Helmand Province of Afghanistan May 18, 2008. 16. A horse-drawn carriage carries the body of actress Jennifer Hudson's nephew Julian King on its way to graveside services in Chicago, Illinois November 3, 2008. Members of the Hudson Family were found slain in their home on October 24. 17. Lebanon's Hezbollah guerrillas carry the coffin of assassinated commander Imad Moughniyah during his funeral in Beirut's suburbs February 14, 2008. 18. Red Army soldiers killed during World War Two are seen during the reburial ceremony near the small village of Sukhaya, Ukraine, May 9, 2008. 19. Supporters of the People's Alliance for Democracy push against a gate as police officers stand behind, in Bangkok August 29, 2008. 20. Protesters holding candles march during a rally demanding a full-scale renegotiation of the beef deal with the U.S. and the resignation of President Lee Myung-bak around the city hall in Seoul June 7, 2008. 21. Police drag a Tibetan monk trying to reach the Chinese Embassy Visa Section in Kathmandu April 29, 2008. 22. Protesters attempting to march on the road leading to the presidential Blue House and the U.S. Embassy use water from a fire hydrant at the police as police use water cannons and fire extinguishers on them, in Seoul June 28, 2008. 23. People, most of them members of the Argentine Jewish community, hold up pictures of the victims of the 1994 bombing in the AMIA Jewish center during the commemoration of the 14th anniversary of the attack in Buenos Aires, July 18, 2008. 24. An indigenous woman holds her child while trying to resist the advance of Amazonas state policemen who were expelling the woman and some 200 other members of the Landless Movement from a privately-owned tract of land on the outskirts of Manaus, in the heart of the Brazilian Amazon March 11, 2008. 25. Men pose with a gay pride flag during the opening of the gay and lesbian community's summer at a beach on the outskirts of Havana June 14, 2008. 26. Force India Formula One driver Giancarlo Fisichella of Italy, top, and Williams Formula One driver Kazuki Nakajima of Japan crash after the start of the F1 Grand Prix of Turkey at Istanbul Park May 11, 2008. 27. 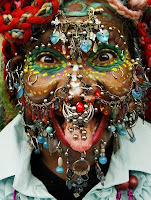 Guinness World Record holder for the Most Pierced Woman Elaine Davidson, poses for a photograph in the Royal Mile in Edinburgh, Scotland showing some of her 5920 piercings on May 16, 2008. 28. A contestant competes during the final of the Most Beautiful Bottom in the World competition in Paris November 12, 2008. 29. Hungarian dancers perform at the dress rehearsal of a three-piece modern ballet entitled Passion at the Budapest Opera House March 5, 2008. 30. Huang Chuncai poses before his second operation to remove his tumours, which weigh around 10kg, at a hospital in Guangzhou, southern China's Guangdong province, January 3, 2008. 31. A malnourished child lies in a hospital ward in Mogadishu February 9, 2008. 32. A model presents a creation by British designer John Galliano as part of his Fall/Winter 2008/09 men's ready-to-wear fashion collection at Paris Fashion Week, January 18, 2008. 33. Models display body-art during the Body-Art Fashion Festival 2008 in Kiev, February 07, 2008. 34. Manuel Uribe jokes as he holds a fruit cake with his girlfriend Claudia Solis outside his house in?Monterrey June 11, 2008. Uribe was once the world's most obese man. 35. A naked protestor signals to police during a demonstration by political activists in Malmo September 19, 2008. 36. 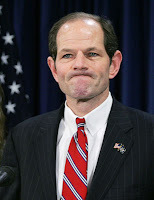 New York Governor Eliot Spitzer addresses the media at his office in New York, March 10, 2008, after he was linked to a high-profile prostitution ring. 37. Soldiers carry the coffin of former Indonesian president Suharto in Jakarta January 28, 2008.World leaders praised Suharto for the stability and growth he brought to the region but said serious rights abuses marred his long rule. 38. Alexander Solzhenitsyn's son Ignat and his grandson Andrei bid farewell at the coffin of the late writer and former Soviet dissident in the Academy of Science in Moscow August 5, 2008. 39. Soldiers carry out relief work on the rubble at the earthquake-hit Beichuan County, about 160 kilometers northeast of the epicenter of Wenchuan County, Sichuan Province, May 13, 2008. 40. Soldiers rescue a child from the rubble after an earthquake in Beichuan, Sichuan province May 13, 2008. 41. The body of Maharishi Mahesh Yogi in the northern Indian city of Allahabad February 10, 2008. The embalmed body of Yogi, the Indian mystic and Beatles guru who helped bring transcendental meditation to the West, was cremated on a huge pyre of sandalwood by India s holiest river.